Nine weeks away from their attendance at the COP 17 Climate Change Negotiations in Durban, South Africa, students of Dickinson College’s delegation joined with classmates to participate in Climate Interactive’s World Climate Exercise. These eleven undergraduates are taking four courses this semester to provide them an interdisciplinary study of how we can address climate change. Each of the student delegates reflected on their experience on the class blog http://blogs.dickinson.edu/cop17durban/. 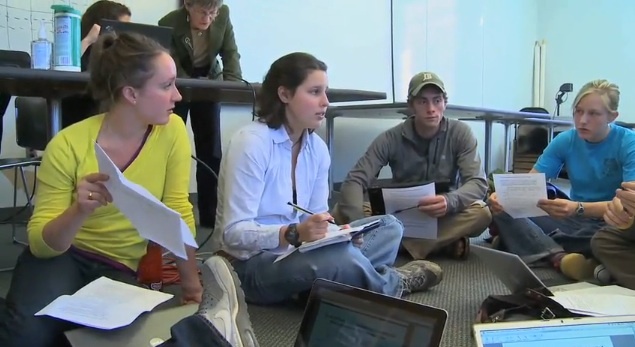 The World Climate Exercise, which the students participated in three weeks into their coursework, was facilitated by Neil Leary, Director of Dickinson’s Center for Sustainability Education. The exercise extended three hours and used Climate Interactive’s C-LEARN simulation to model the emissions reductions of three different regional blocs of nations that the students were separated into. Students reported concluding their negotiating rounds and getting their projected CO2 levels to 590ppm in 2100, a slight decrease from the business as usual trajectory but still a long ways from targets of 400ppm or lower that are called for internationally. In addition to simulating negotiations around mitigation targets, the group also tried to work out the amount of financing that developed countries would provide to support developing countries in addressing climate change and adapting to the effects. Many students reflected that it was tough to know how much was reasonable for developed countries to provide without a more nuanced understanding of how far a billion or a trillion dollars will go in supporting developing countries’ mitigation and adaptation efforts — similar questions plague the actual UNFCCC negotiations. The painful balance of economic and environmental responsibility at times was almost too much to bear. Participating in the World Climate simulation was highly informative and absolutely formed a better awareness of the controversies, funding privations, and difficulties in agreements that may occur while we attend COP-17. We have now developed a better understanding of how compromise works; it sure isn’t easy. One trillion dollars…okay, deal! Wait, what? World Climate Summit at Dickinson College! The World Climate Exercise was developed by Climate Interactive and MIT. All of the resources to run the exercise are freely available at http://climateinteractive.org/simulations/world-climate/.